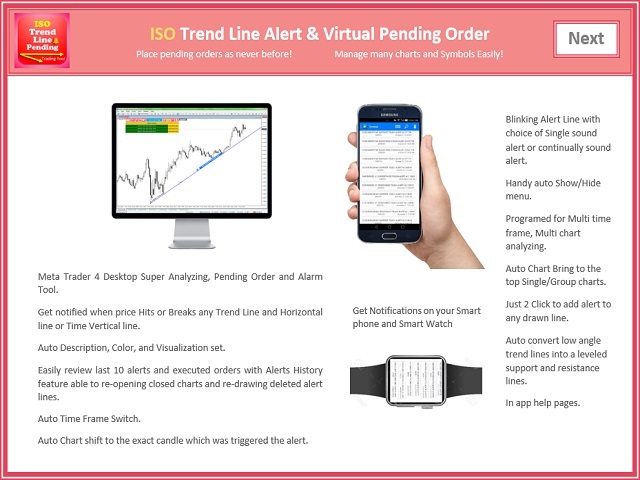 ISO Trend Line Pending Expert is a unique professional tool which can turn any selected Trend Line, Support Line and Resistance Line on your chart into a pending order line or Alert line with different trigger methods. With various order types including Price Touch, Price Break Out and Candle Close Break Out. 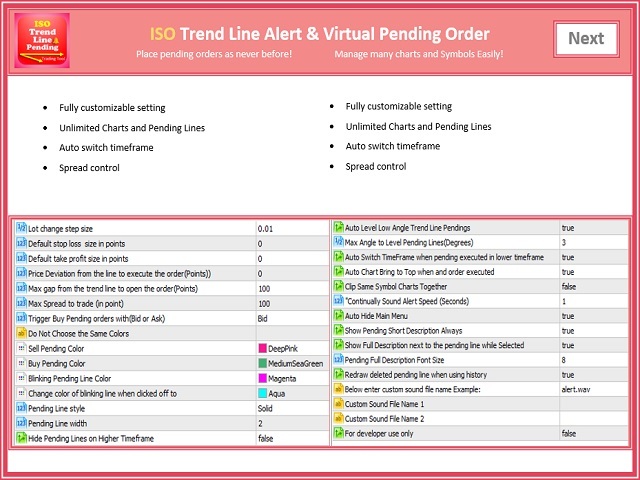 The Order History feature will let you to have a quick access to all other charts which an order has been executed. 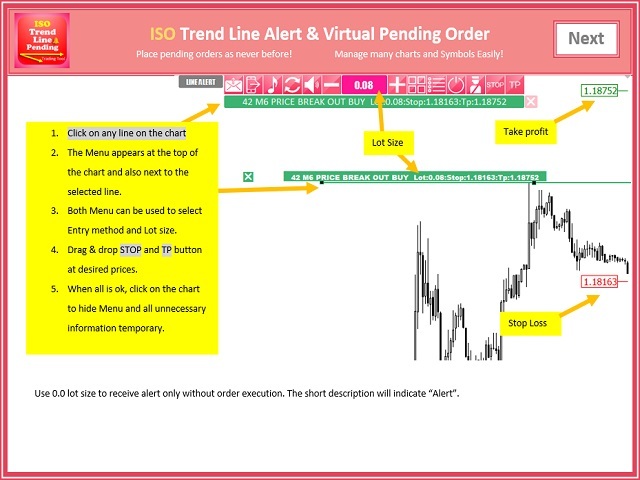 It’s truly designed to help traders easily trade and manage many charts and symbols without staring at the screen. 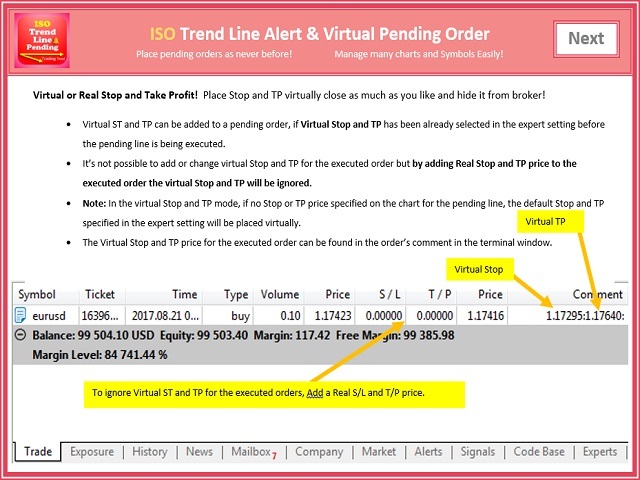 Easy Order's Lot, Stop loss and Take profit adjustment. Virtual and Real Stop loss and Take profit. Auto Stop loss, Take profit and Lot size correctness check. 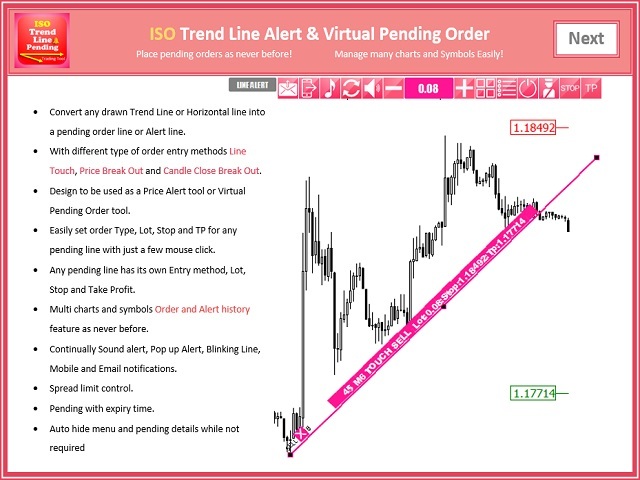 Pending Line with expiration time if not triggered. 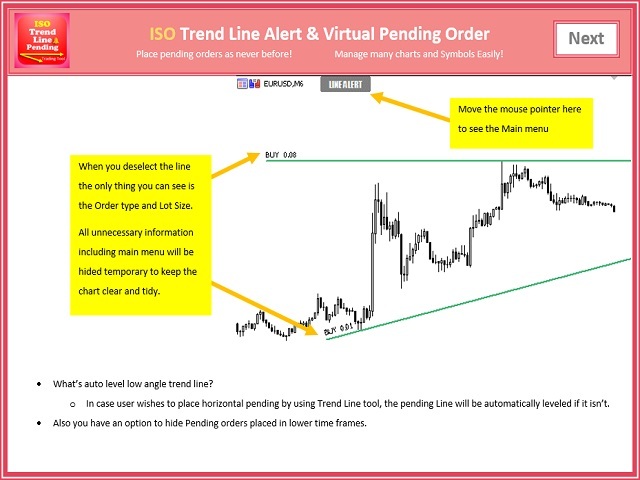 Auto convert low angle trend line into a leveled support and resistance line. 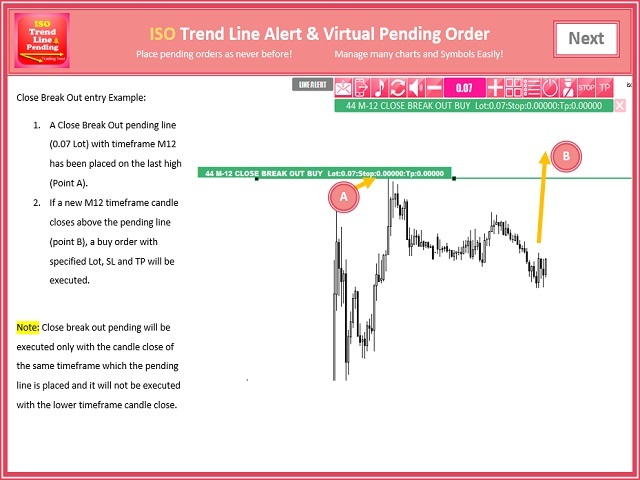 Candle Close Break out Pending will be triggered only if a candle with the same time frame as Pending line activated, closed above or below the line. 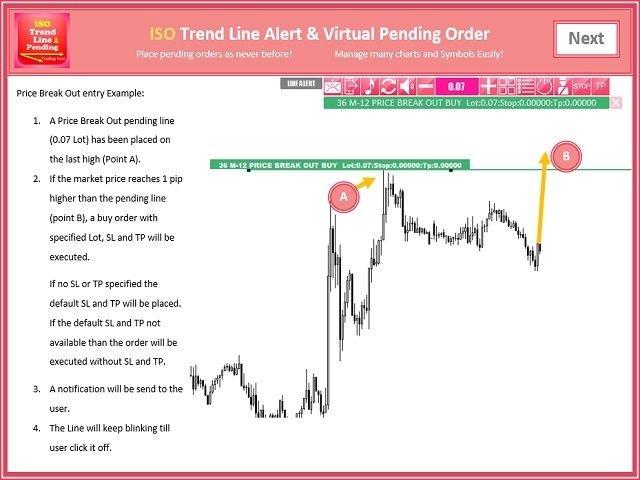 Example: If a Pending line description shows (Daily Support Break out Alert). So in this case if a daily candle closed below the line then a sell order will be executed. 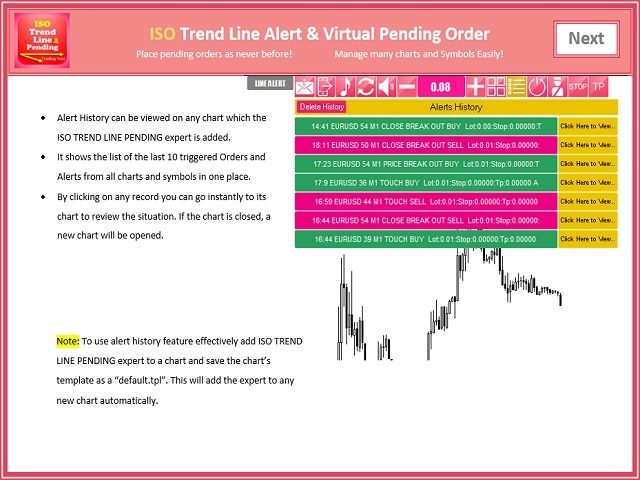 Auto Hide Pending lines on higher time frames. Unfortunately, the expert can't be tested in the Strategy Tester properly as its using MetaTrader tool bars and time frame switching. 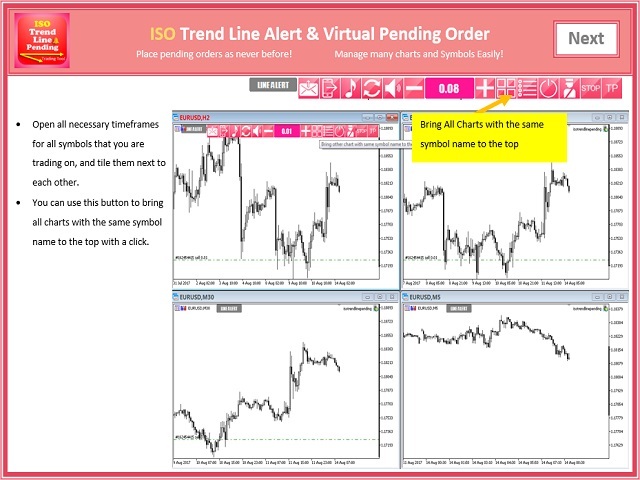 ISOForex, Developing MetaTrader trading tools and indicators for over 7 years. Your feedback will encourage and guides us to improve the product in the future updates. it is a great ea. it will be a perfect ea if tp2,parital close and breakeven futures are added. 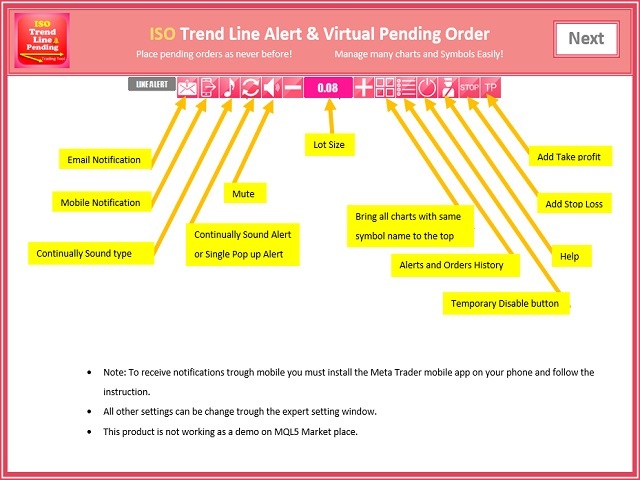 Warning added while running the product as a demo on tester.